Lush, heavy, hard pop is desperately needed in a scene that’s gone overboard riding the trends of jam bands, world beat and aggro-rock. And the domani international has it. 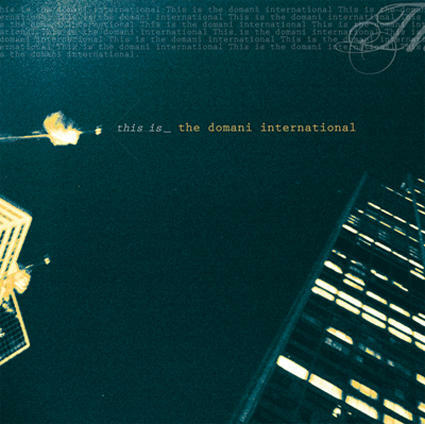 The five-song EP, this is_the domani international [independent release] is the baby of St. Louisian, Josh Brett (Simple Mary’s Diary) and company, with musician/producer Kevin Clay--who’s had a successful regional career as a solo singer/songwriter and as frontman/spearhead of the amazing 90s band, my little dog china. Other musicians on the disc include Chris Kelley, Robert Meyer, Steve Wilson and Nil Desilva. While ‘domani’ means ‘tomorrow’ in Italian, the domani international give a nod to the 4AD record label-type bands of the mid-90s, but this band has grown up and evolved to keep up with the technology and pace of this new Millennium. the domani international mixes tracked loops and flesh-and-blood percussion to brilliant effect; but it’s the skillful, catchy vocals that really sell these songs and keep them in your head all day. Track number one, for example: “into forever,” is lush, smooth, heavy and dreamy, like a venti mocha frappuccino with a kick of something naughty. Next up is “such sweet sorrow,” which starts off sounding like your too-cool-for-school, Death Cab for Cutie-style indie rock, but then blasts off into pure pop. Both “our colliding age,” and “just keep breathing,” really show that Josh Brett is a disciple of Jeff Buckley--but while Brett’s gained Buckley’s control and beauty, he has roughed up the edges and made it his own--more in the spirit of his other vocal hero, Greg Dulli (the Afghan Whigs). And the last track, “out of a vulgar machine,” is a building, inspiring anthem in direct contradiction to its self-deprecating lyrics (or are they? It’s hard to tell). And about those lyrics—the domani international’s words are poignant enough to resonate, poetic enough to seduce the coldest heart, and yet abstract enough to mean almost anything you want them to. Sounds like a winning formula to me. Full of instrumental surprises, each song on this is_the domani international never quite takes you where you expect it to go. And that’s a welcome detour.